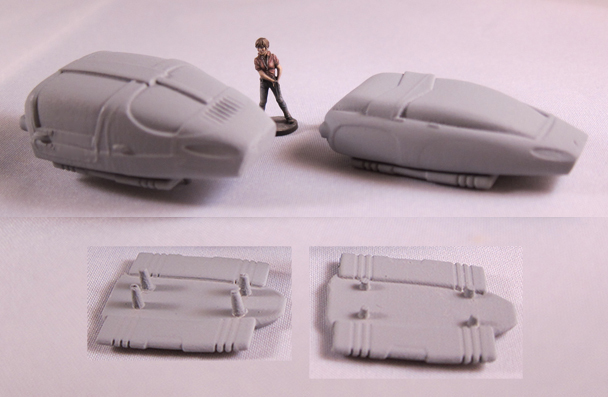 Shown here are the various 15mm science fiction vehicles we produce. 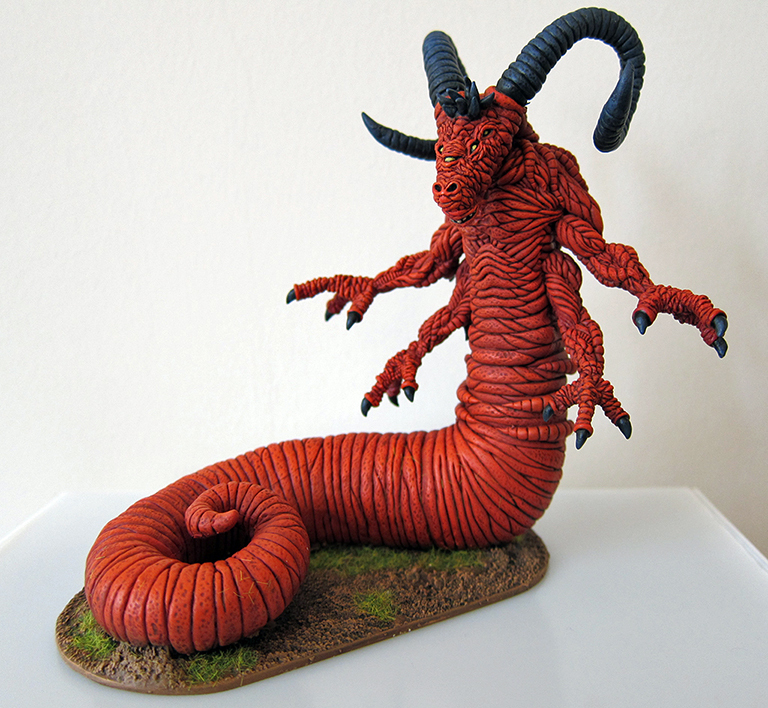 Whilst they were designed to work with 15mm sci fi figures, and most of them show it, some of them are "scaleless," meaning they can be used in 28mm or other scales. 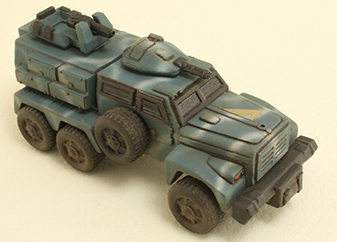 These are the same vehicles as listed on our various in-universe pages, but accumulated on one page without the background "fluff" as some gamers prefer to browse products that way. Most pieces are largely resin, and some also have some white metal parts. 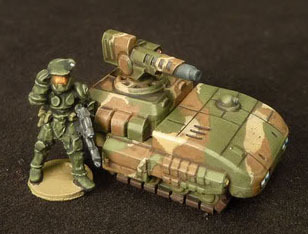 The generic listing of 15mm Sci Fi infantry may be seen HERE. 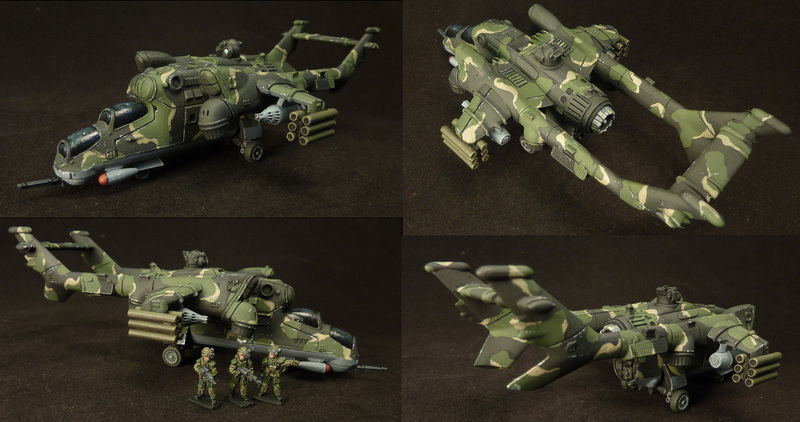 Large, powerful VTOL gunship in three choices -- two different open door versions with door gunners (either army or special forces, the army gunners wearing more armour), or buttoned up with the panels on the sides. There's an exit ramp on the back of the passenger compartment, and the craft is big enough to carry about eight passengers into combat. 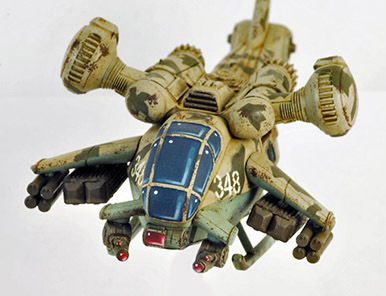 The gunship is loaded for bear, with up to a dozen heavy anti-material missiles, two pulse laser cannons, and four boxes of anti-personnel rockets. 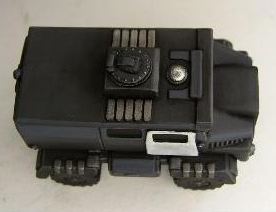 The kits with door gunners come with four -- two with rotary cannon and two with pulser. 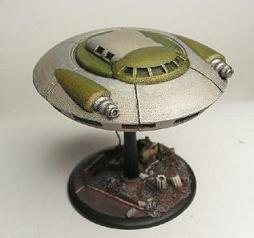 There is a flying base available as well for those who don't make their own and want to depict the craft flying. 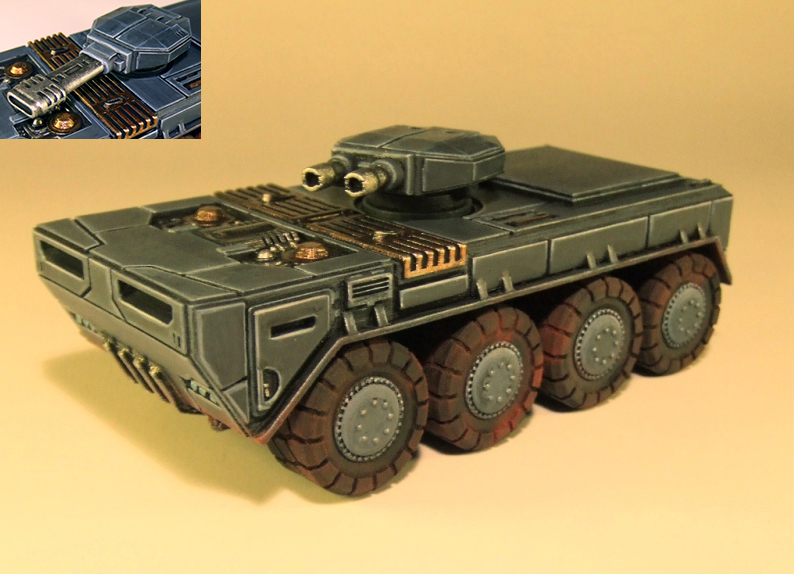 Red Faction APC with wheels, approximately 77mm long, for less pretigious formations which do not rate the tracked heavy APC (probably the vast majority of Red Faction motorized infantry). 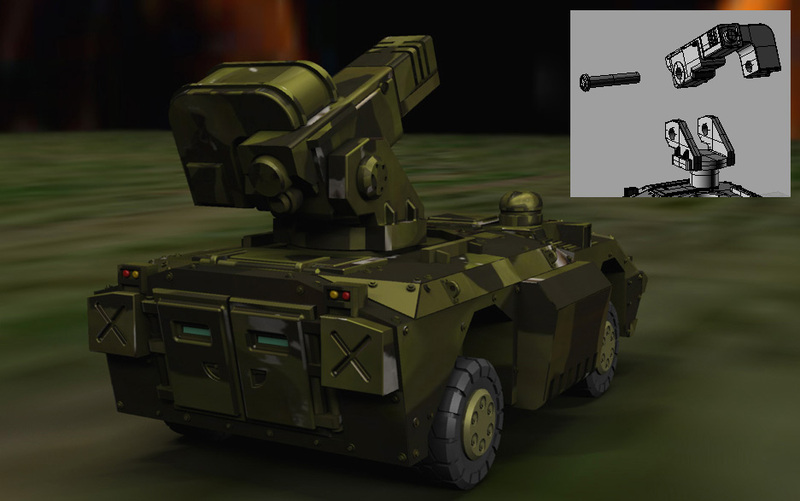 Kit comes with the same turret as the Red Faction Tracked APC, and also with the same light laser as the Cossack and a simple plug to make the vehicle an ambulance or unarmed transporter used by the Red Faction. All-terrain trucks for transport, patrol or combat in extremely inhospitable environments such as deserts or rocky terrain. Four variable-height suspension arms raise the truck at clearances which may be set based on terrain needs, each arm mounting a bogie with two large wheels for maximum stability over difficult ground. 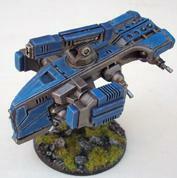 Mounts a twin cannon system in a turret and, in a chin mount, a light pulser. 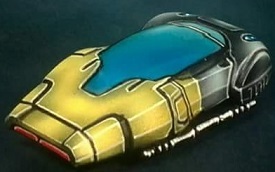 The front of the vehicle is armoured. This model is supplied with white metal suspension arms which may be set at various heights, from close to ground level to extreme elevation. 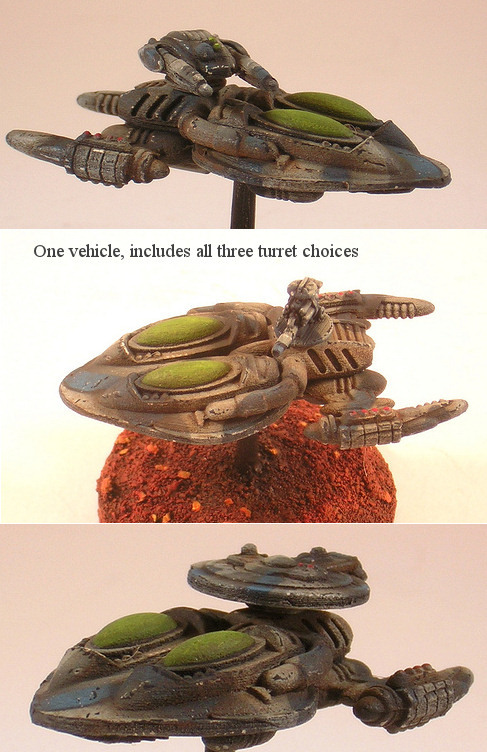 The bogeys may also be swiveled at their base to show the vehicle in the midst of a turn. 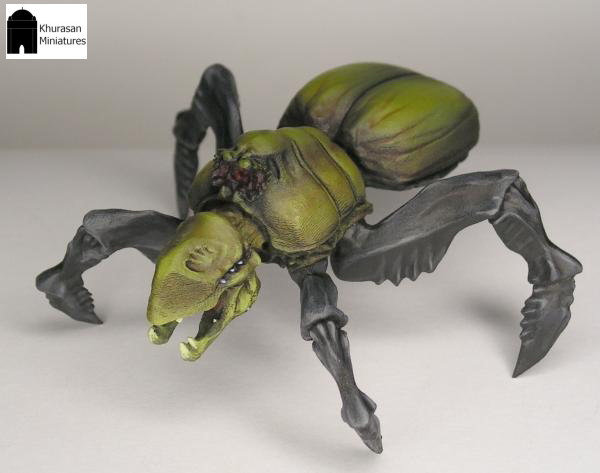 The model's suspension is in fact completely posable and it may be built crawling over very inhospitable terrain on a very striking diorama base if the gamer chooses! 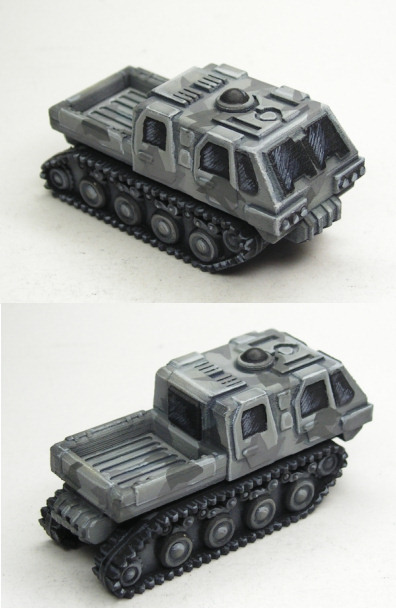 This is a large (75mm), heavily armoured prime mover with a fifth wheel coupler so that you can attach any of a number of upcoming military trailers featuring assorted weapons or cargo loads. Alternately an armoured rear box can be dropped right over the fifth wheel to convert the armoured tractor into an armoured guntruck. 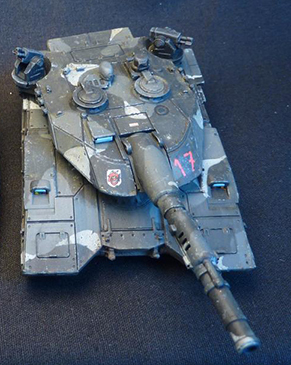 This can be left unglued and so the same kit can fulfill either mission in a game. 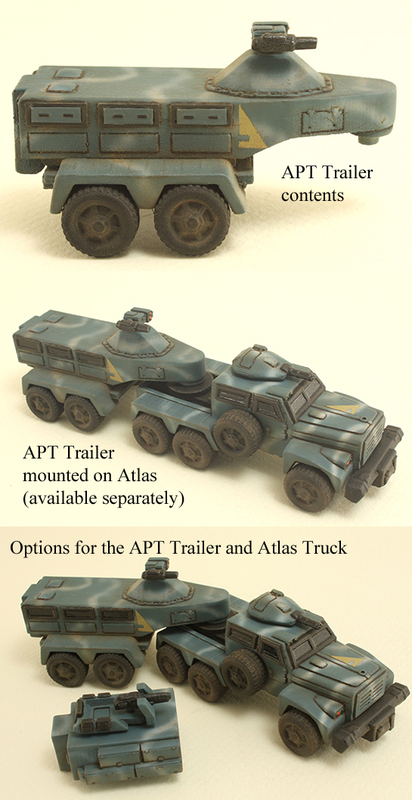 The set also comes with two RRTs (robot rotary turrets), two manned laser stations (which will accept our Federal vehicle crewmen, sold separately), and two round covers so that you can cover up either, or both, of the turret emplacements. The kit also comes with armoured window covers that drop over all the windows like the armoured plates on the WWII "Dragon Wagon." 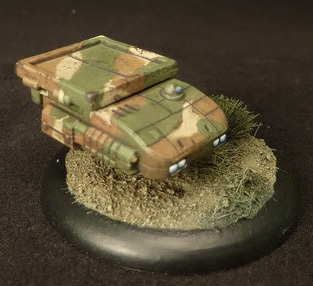 The heavily armoured trailer can carry a squad of men into battle and has a heavy grenade lanucher mounted in the citadel on top. Like the truck, it comes with optional armoured window covers. 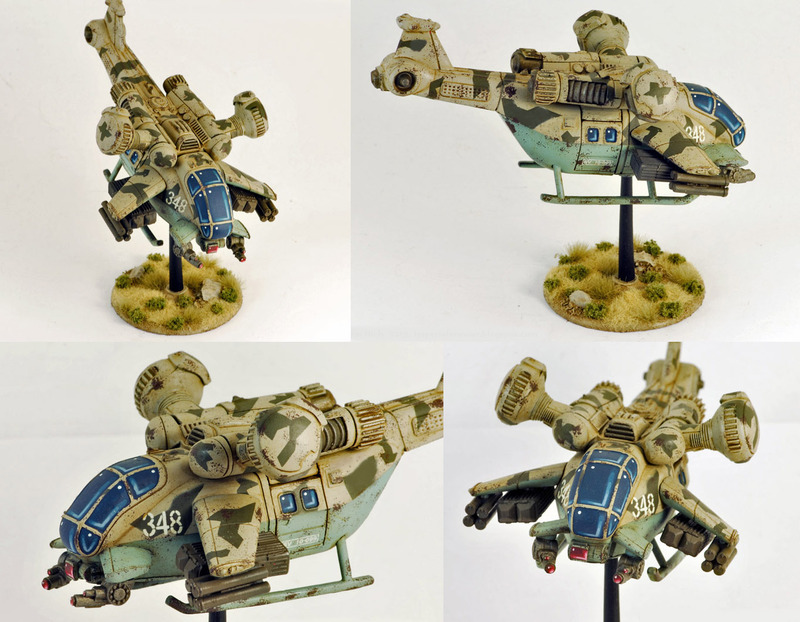 A small VTOL gunship which can be either a remote/drone, piloted by one crew, or biomechanical. The wings are posable. The kit is all pewter. 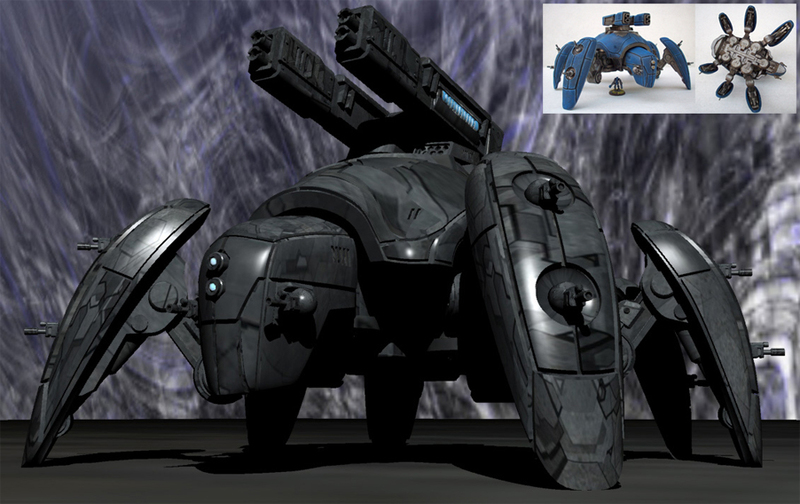 A large, articulated vehicle with posable legs and two head-mounted energy cannons, the Insectoid Walker Tank can be used as an APC (there are exit hatches below each leg-bearing segment), an MBT or mech, or even fielded as a BOLO-like living machine. The kit is extremely posable. 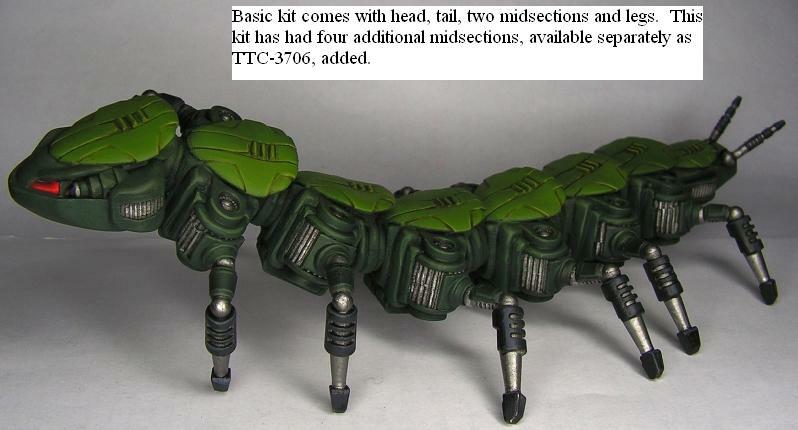 The basic kit comes with two middle sections, the minimum needed to support it but with additional body segments added can be as long as you fancy. The kit shown in the image to left has had four additional mid-sections added, and is quite large indeed. 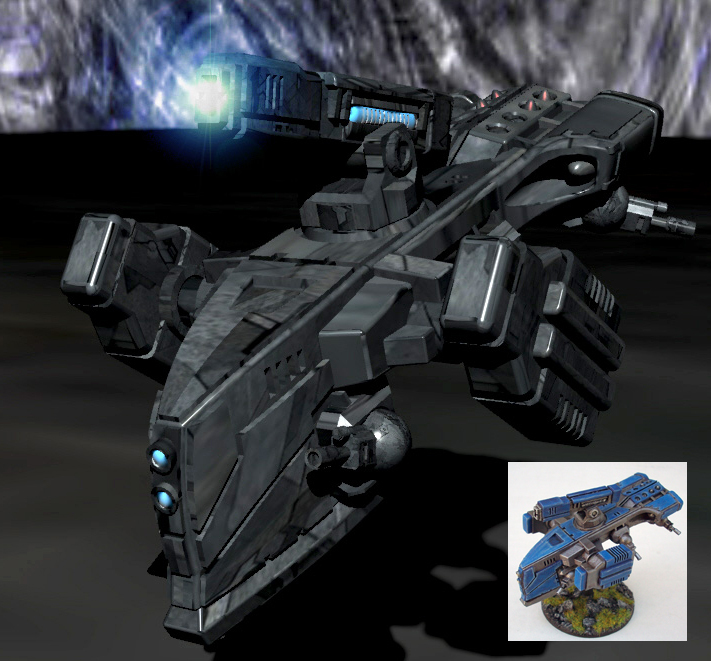 Formidable, sinister-looking Red Faction attack VTOL, heavily armed yet still large enough to carry a team of Speznatz or lesser troops into combat. A more complex resin and pewter kit than your average bear (or hind). For some assembly hints, check out this blog post. Gear can be modeled up or down (both options are shown in the exploded view in the image linked below). 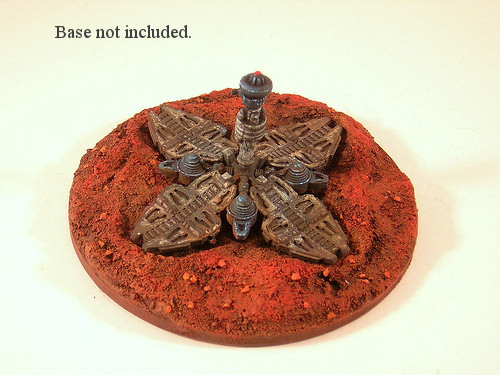 The kit does not come with a flight base -- a pewter base can be purchased separately (inquire if interested). Red faction "power armour" so large that it is in substance a small mecha. 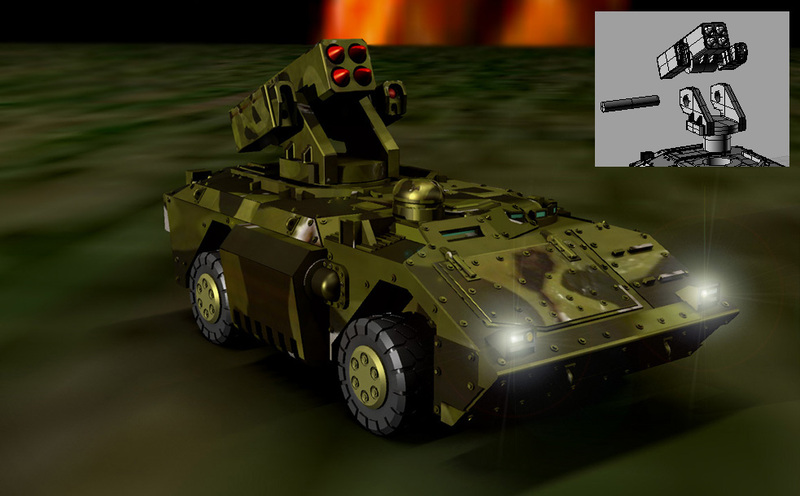 Like all other Red faction equipment, it is uncomfortable to operate but heavily armed with four 20mm cannons, a missile mount, and a debris punch on each arm for rubble clearance or close combat. 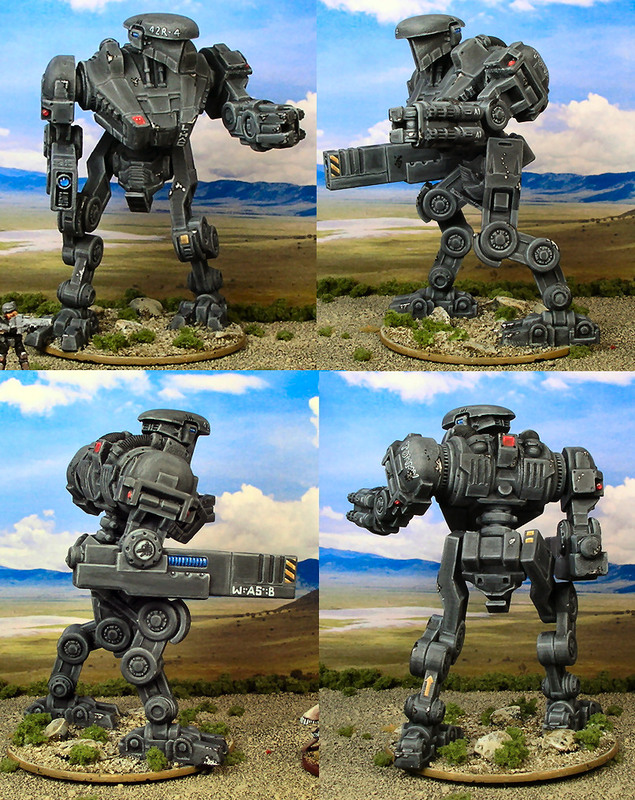 Pack comes with two complete "suits," with two different leg and 20mm cannon arm sets, and each is highly posable. 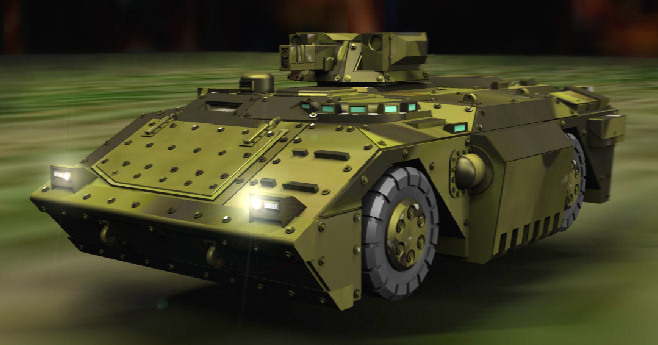 Armed ASVs -- mounting one of three types of weapons: a plasma gun, a missile launcher or an advanced heavy machine gun. Utility ASVs -- mounting a flatbed, which can carry a variety of burdens. Medevac ASVs -- with a propulsion bot, stasis chamber system and "RoboDoc", to perform on-the-spot treatment or evacuate more serious casualties with the stasis chamber preventing deterioration in the casualty's condition. 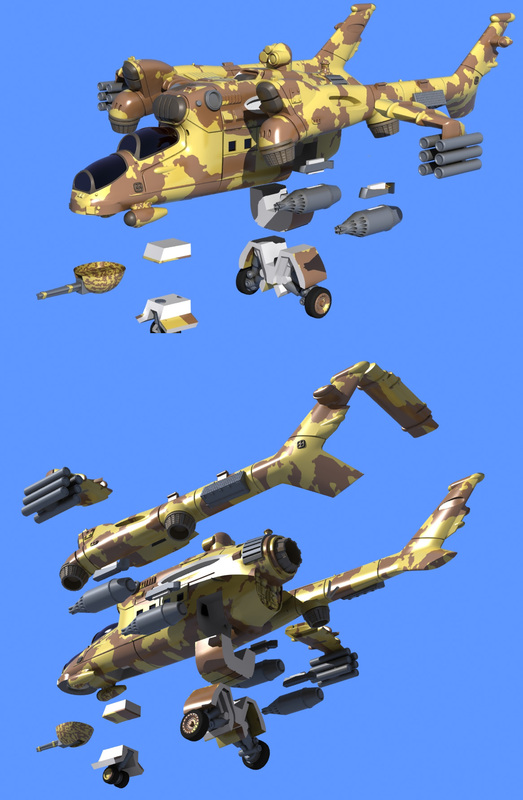 The images of the Armed ASVs show all three gun options which are provided, permitting any one of them to be built. Only one ASV is in each pack. A medium tank with conventional tracked propulsion to fill out the main battle role in human "Blue" forces. 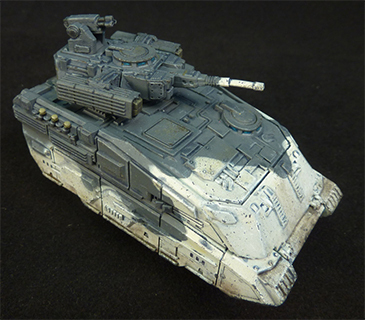 Plasma cannon, posable hatches and close defence gatling gun are pewter, the remainder of the kit is resin (the resin castings are extremely clean and require very, very little cleanup). 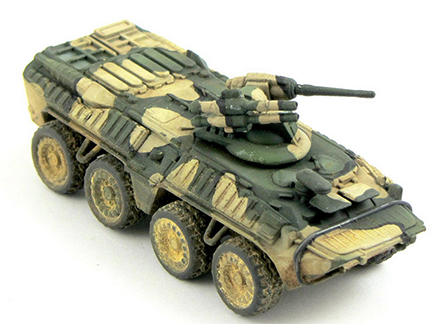 A platoon deal at a lower price is also available for four kits. 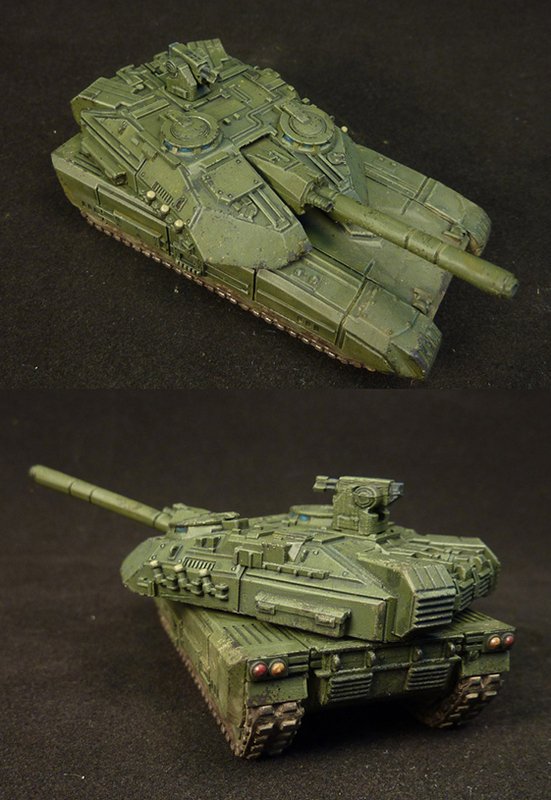 A medium tank with conventional tracked propulsion to fill out the main battle role in human "Blue" forces. 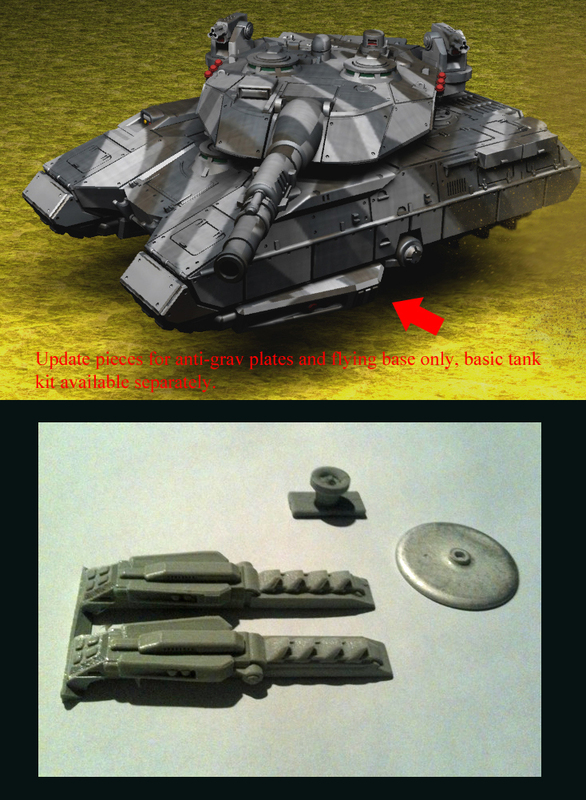 CPR cannon, posable hatches and close defence gatling gun are pewter, the remainder of the kit is resin (the resin castings are extremely clean and require very, very little cleanup). 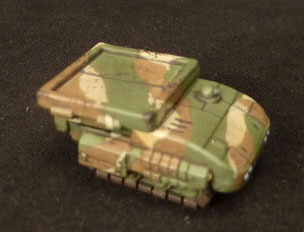 A medium tank with first-generation, low-hover anti-grav drive to fill out the main battle role in human "Blue" forces. 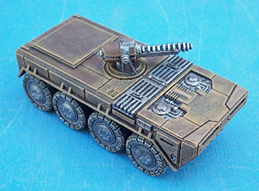 Plasma cannon, posable hatches and close defence gatling gun are pewter, the remainder of the kit is resin (the resin castings are extremely clean and require very, very little cleanup). A large and heavily armoured APC with conventional tracked propulsion for "Blue" forces to carry large numbers of troopers in body armour directly to the fight. 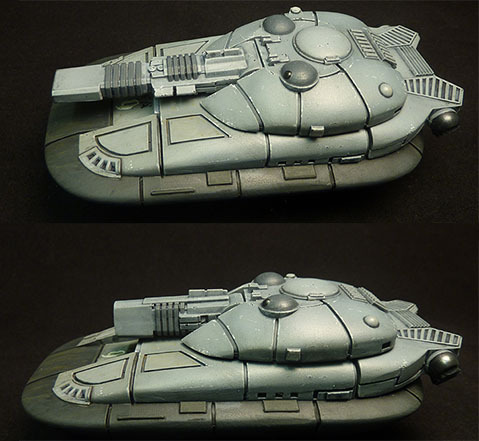 Rapid fire plasma cannon, posable commander's hatch, brackets for the missile boxes and close defence gatling gun are pewter, the remainder of the kit is resin (the resin castings are extremely clean and require very, very little cleanup). 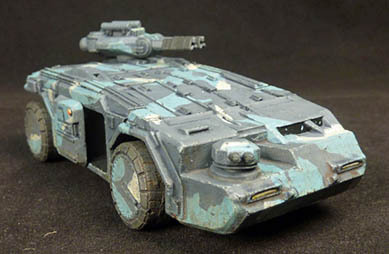 A large and heavily armoured APC with first-generation, low-hover anti-grav drive for "Blue" forces to carry large numbers of troopers in body armour directly to the fight. 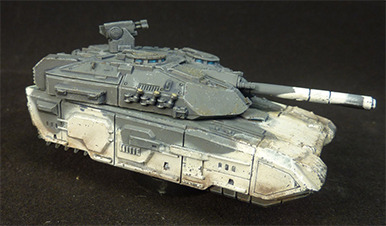 Rapid fire plasma cannon, posable commander's hatch, brackets for the missile boxes and close defence gatling gun are pewter, the remainder of the kit is resin (the resin castings are extremely clean and require very, very little cleanup). 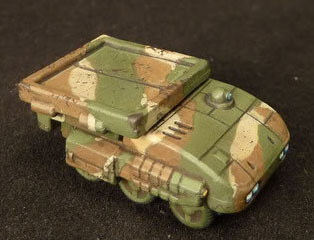 APC that can operate in road mode or can retract its wheels and go into anti-grav mode. 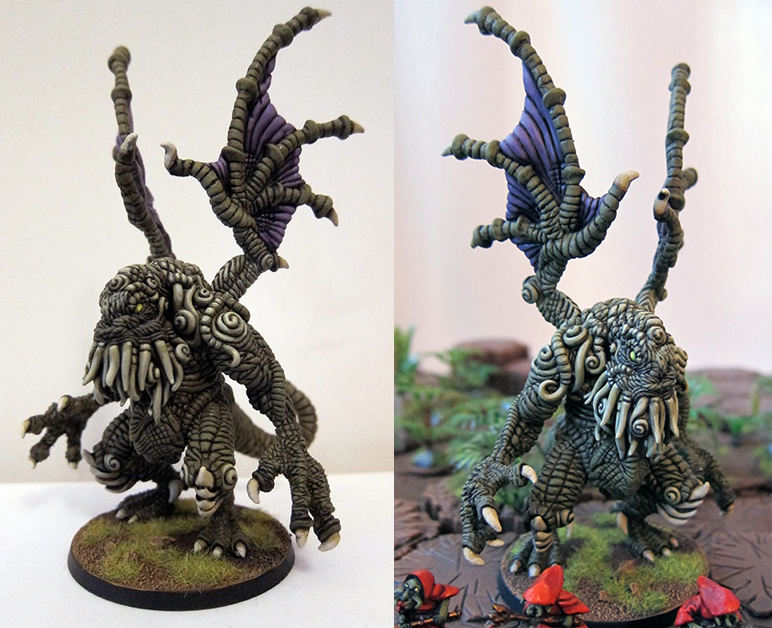 The model can be depicted in either mode and comes with an optional flight base. 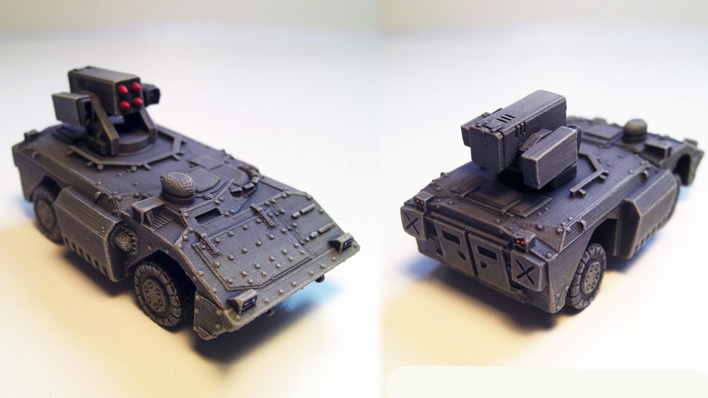 Gun carriage based on lengthened APC chassis, which like the APC can operate in road mode or can retract its wheels and go into anti-grav mode. 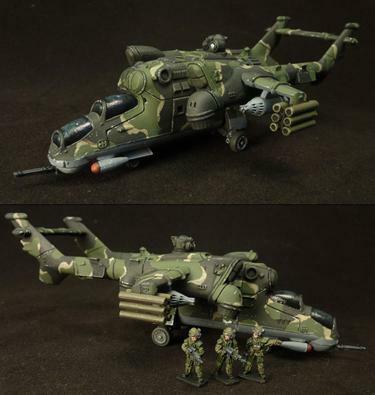 The model can be depicted in either mode and comes with an optional flight base. It comes with three different weapons options, one of which may be used with each kit. 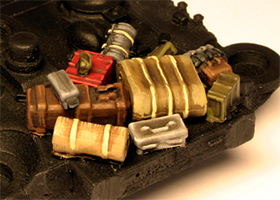 If swappability of weapons load is preferred, additional gun cradles and pins are available separately. 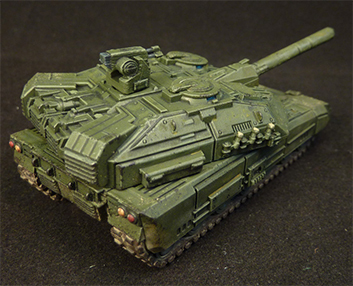 It's the perfect weapons accompaniment to the APC, or can operate in stand-alone batteries. A large infantry combat carrier with a twin minigun turret as well as a heavy gun turret. 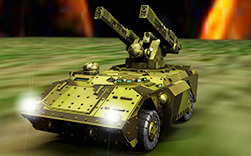 The vehicle is capable of carrying a large squad, and has enough firepower to tackle all but the heaviest enemy elements. The turrets and sliding door are pewter, the rest of the kit is resin. 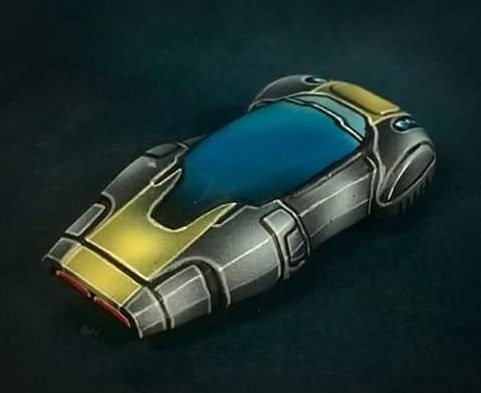 Painted by dwartist. 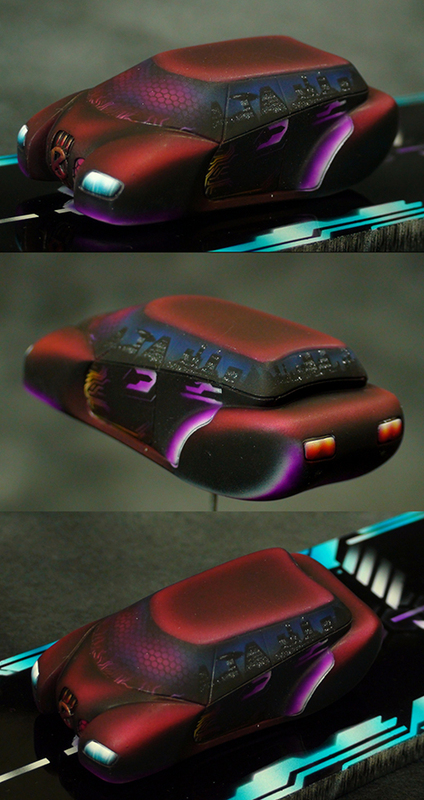 This kit requires a thorough wash before priming, an a non-acrylic primer coat before painting (auto body primer is fine for instance). 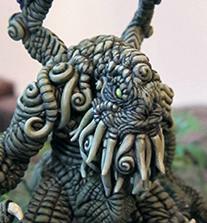 Acrylic paints will not adhere directly to the resin. 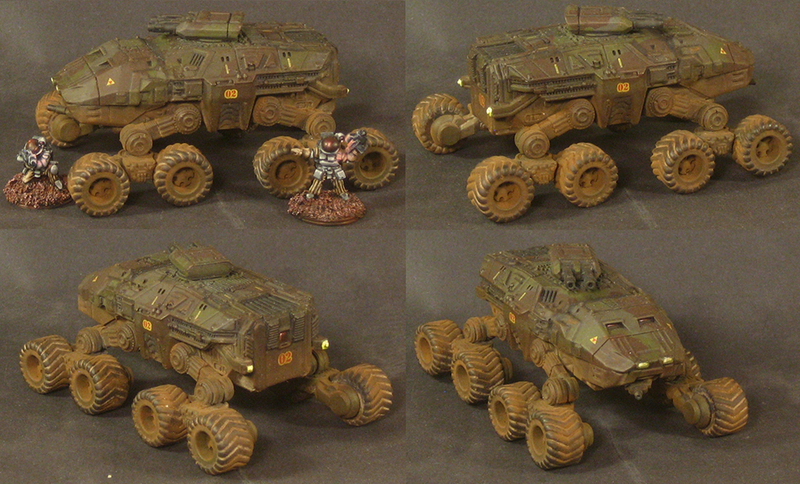 A sci fi HMMWV-sized vehicle for recon, patrol, and carting the high command about. 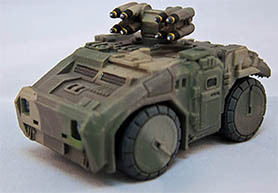 Kit comes with resin body, pewter wheels, a small gatling gun turret and an eight-missile rack for heavy anti-material work. 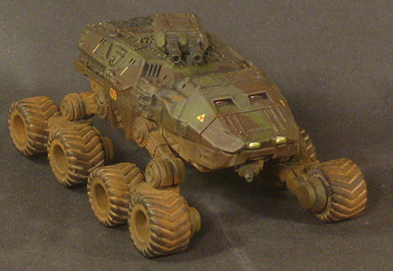 An all-track crawler with a pickup bed, for humans or humanoids. 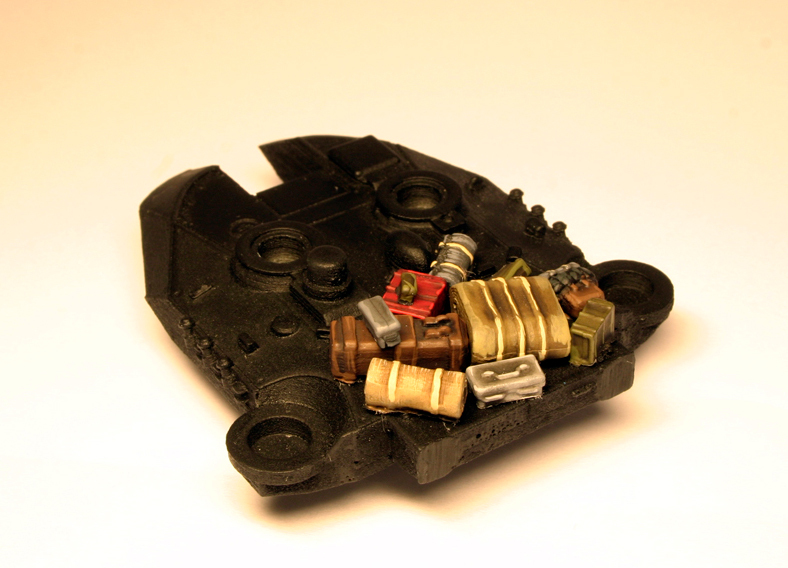 This kit has been reworked to make a better casting, now has pewter track parts which have the gaps correctly portrayed around the wheels, and now has an all-new piece, an optional improvised armoured fighting compartment that is a drop fit into the pickup body. 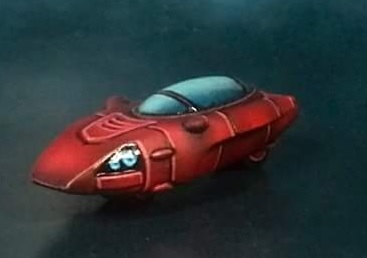 One-piece futuristic cars. 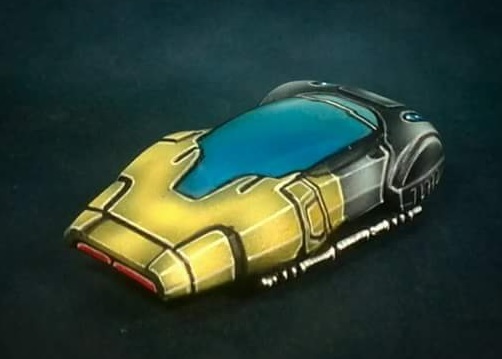 Some are one piece grav vehicles. The multi-passenger models that come in twos have plug-in swappable drives -- the drive parts are made of pewter and fit into a slot on the bottom of the car. 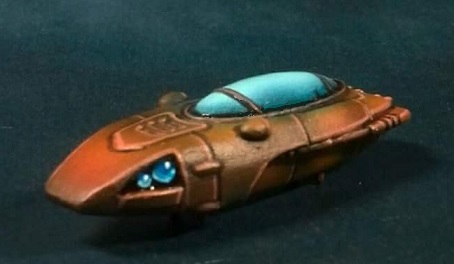 The runabouts are all pewter and one piece castings. 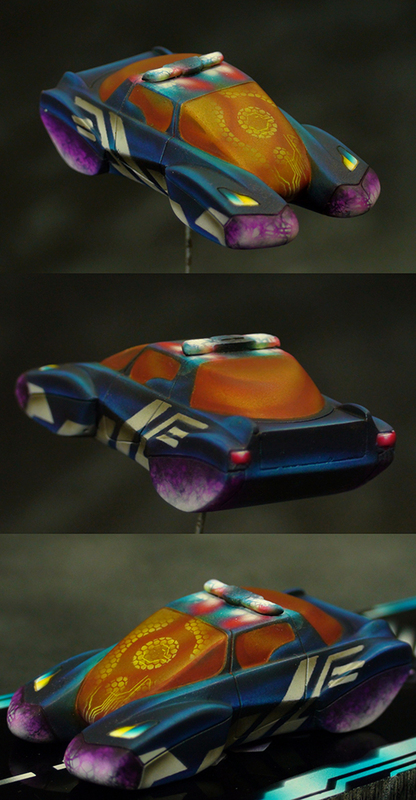 Designed by John Bear Ross, painted by rattle can! 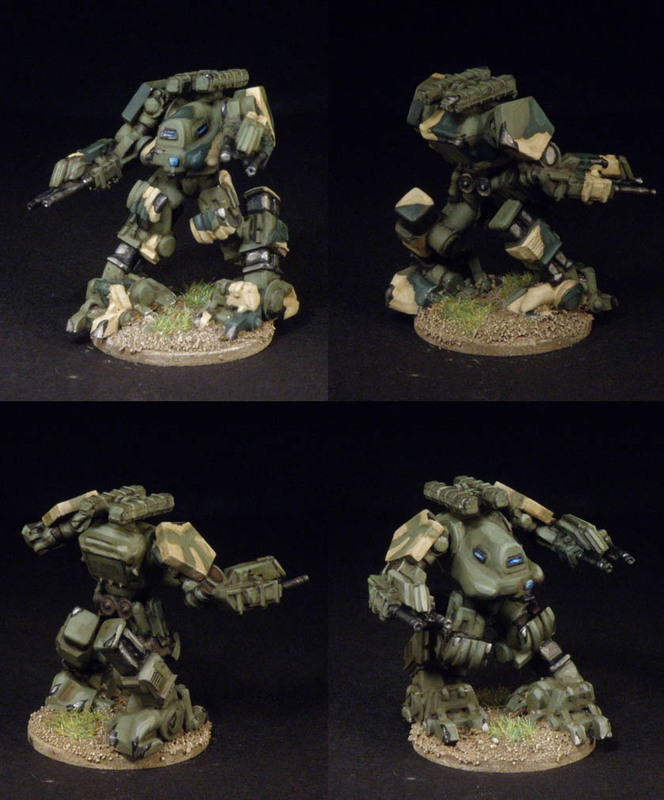 Enormous crawler battle mech bristling with weapons that will dwarf everything else on the table. 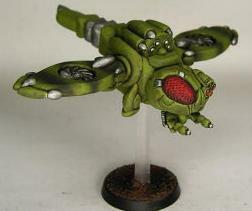 A sentient gunship to cruise the battlefield, looking for biologicals to eradicate. 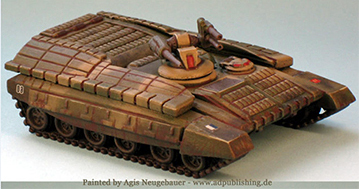 A set of tank stowage for sci fi tanks, to give them a lived in, authentic look. 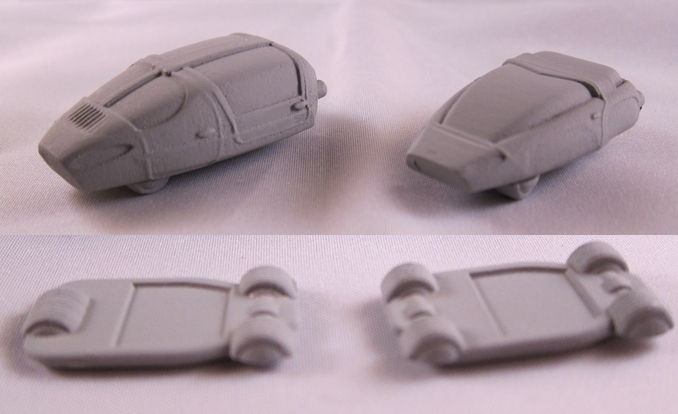 Each little piece is separately cast so it may be placed in varying configurations on different vehicles. 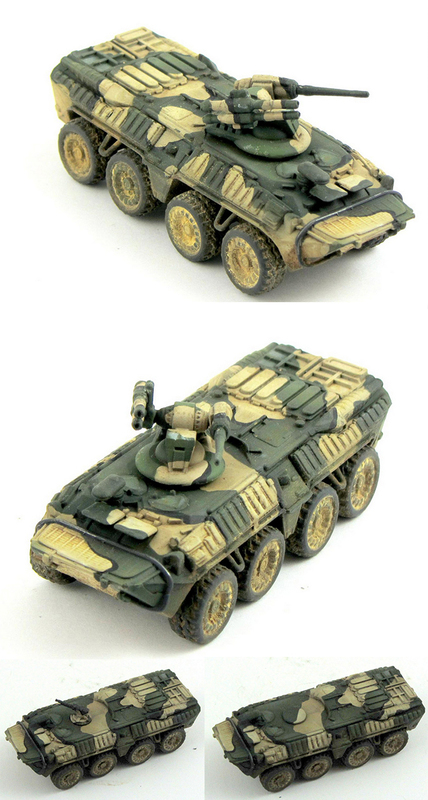 A heavy APC with a distinct neo-soviet flair, built on a tank chassis to ensure full protection for the passengers. Hull is approximately 75mm long. The kit has a mixture of resin and pewter pieces. 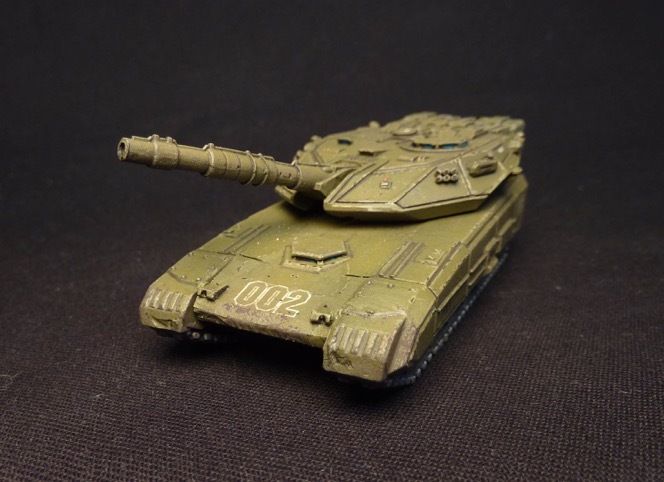 A medium tank with a distinct neo-soviet flair. Hull is approximately 75mm long. 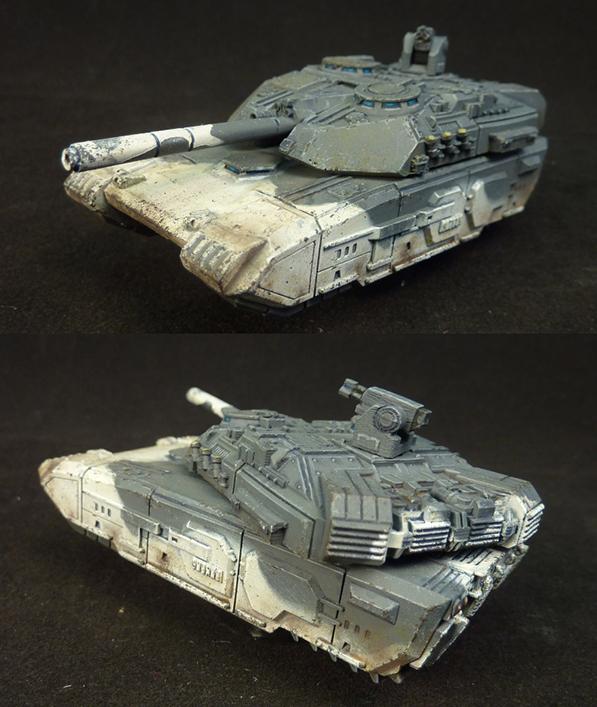 The kits comes with many pieces to configure the vehicle to look like the NF or sci fi equivalent of the T-55, all the way up to the proposed (and then cancelled) Black Eagle tank, and also has an energy weapon main barrel option to go into the realm of straight sci fi. 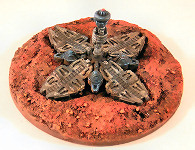 The kit has a mixture of resin and pewter pieces. Click on the product link below to see some of the options that can be built up using the supplied pieces. 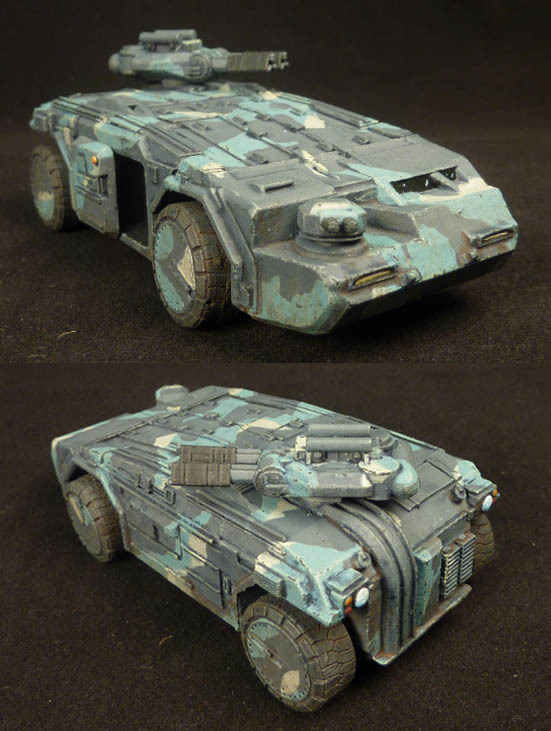 Sinister patrol truck for "disappearing" insurgent leaders or opposition figures, and for showing the flag of the controlling power. These trucks would be handy in low level insurgency suppression, or the arrival of such a truck could be the spark of a firefight. 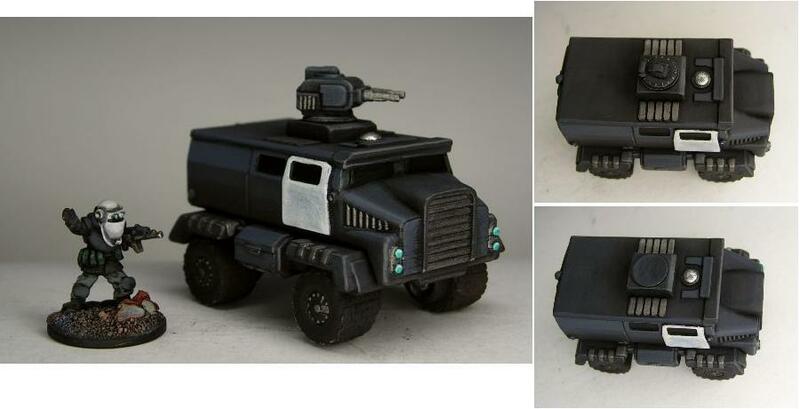 The truck has three options for its top, a hatch, a simple metal plate, or a twin pulse cannon turret. The truck has cameras all around its body to keep an eye on the locals. Technically not vehicles, but vehicles wish they were this dangerous. 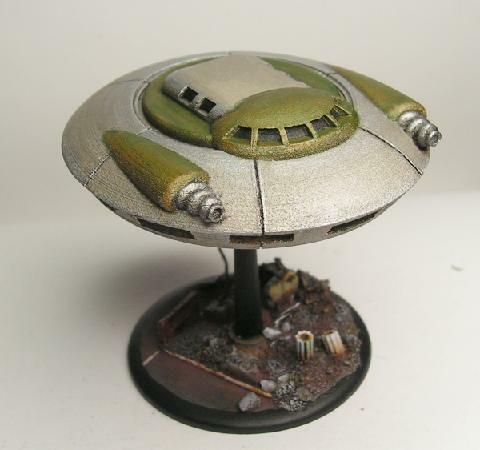 Fifties-style interplanetary transport for little green men with bad intentions. 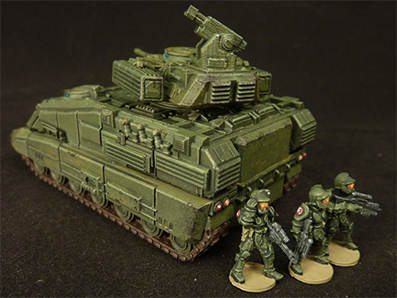 A tight fit for normal 15mm human size models, but fine for our little green men, and also for slimies who can simply slither around onboard. 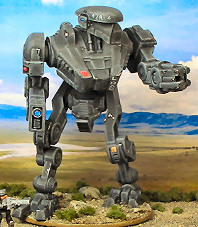 Towering (100mm tall) war mech, highly posable, with a battle cannon on one arm and a claw hand on the other with twin gatling guns attached to it. 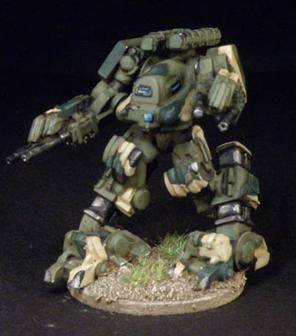 Also highly suitable as a very large combat robot in 28mm scale -- where it would be about 6 meters (20 feet) tall! 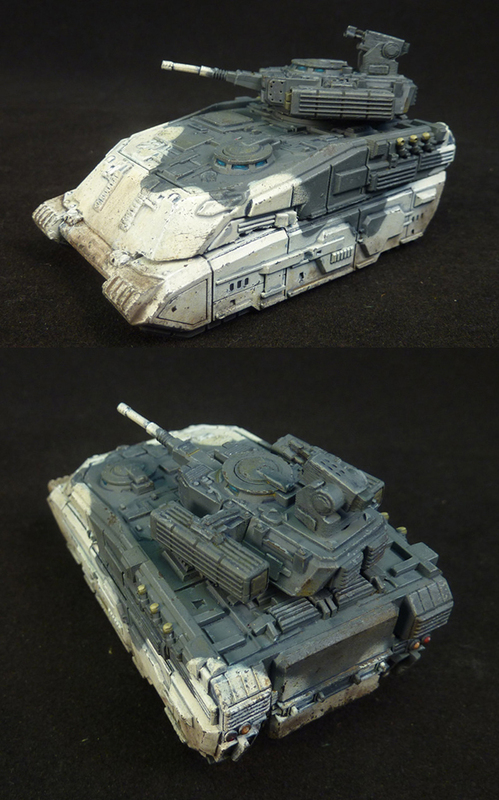 Huge tracked tank with four final drives, very large main armament, two CIDS gatling guns on the turret, and posable hatches for optional crewmen. 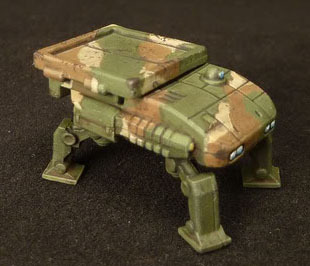 An update set is also available to make the tank anti-grav, a simple switch of the final drive pieces (replacement pieces are a drop fit) plus a sturdy hover base. 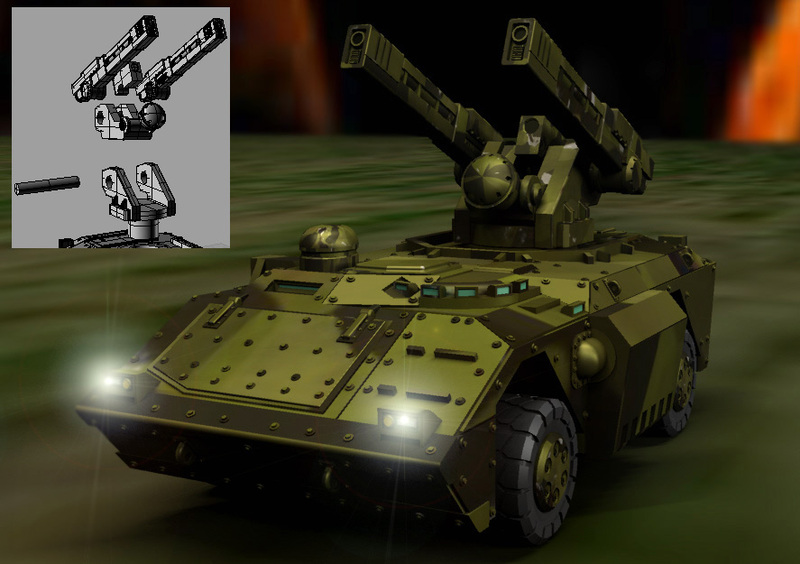 Huge dual-purpose armoured fighting vehicle with eight gigantic wheels, large roof mounted weapons (your choice of either a railgun or a dual heavy autocannon -- image at left shows an earlier variant, now out of production), and enough passenger room for a squad/section of infantry. Not technically a vehicle, but large enough to be one! 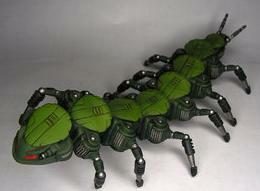 An exceptionally big bug with evolved arms on its thorax serving as "gun doors" for a flame-spouting oriface. 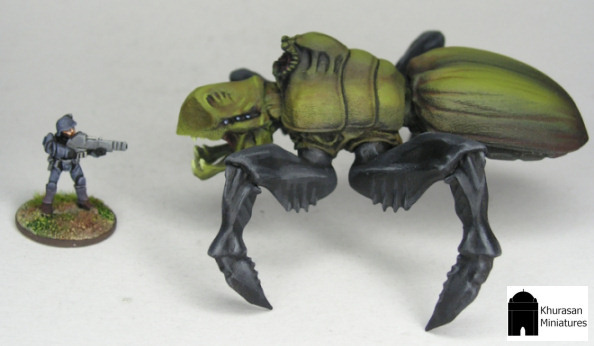 Meant to be a tank-like support for 15mm sci fi swarming bugs, but easily big enough to be a dire menace to 28mm models as well. 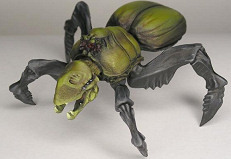 Mixed resin and white metal, posable legs. 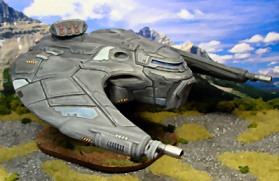 This is a very large model, with a wingspan of 170mm. It can be assembled in a number or different configurations. 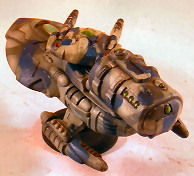 The wingtip heavy laser cannons can be installed, or left off with wingtip covers installed instead (both are included). It has a flight stand and landing gear that can be depicted either up or down, and the vessel can be removed from the flight stand. It comes with a big squarish cargo pod which is used when the vessel operates as a freighter, and this can be attached or left off. 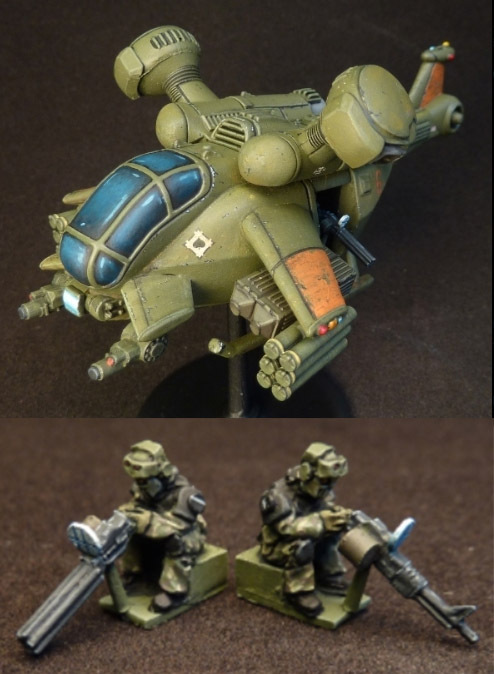 Alternately the belly fill-in (also included) can be used to smooth out the bottom, making the vessel an ideal sci fi light bomber/strike craft or the ultimate 15mm dropship, big enough to insert a platoon into combat. 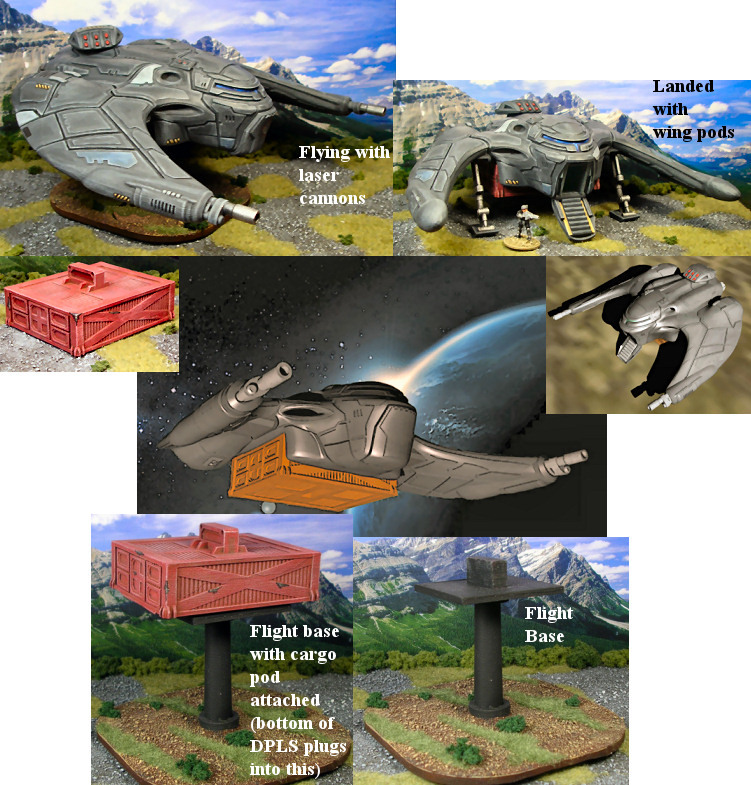 The flight stand plugs into the cargo pod or belly fill-in, and the cargo pod or belly fill-in plugs into the vessel. Or the cargo pod or belly fill-in can be removed and the flight stand plugged directly into the vessel. The exit ramp can also be depicted opened or closed. Multi-purpose is more like it! 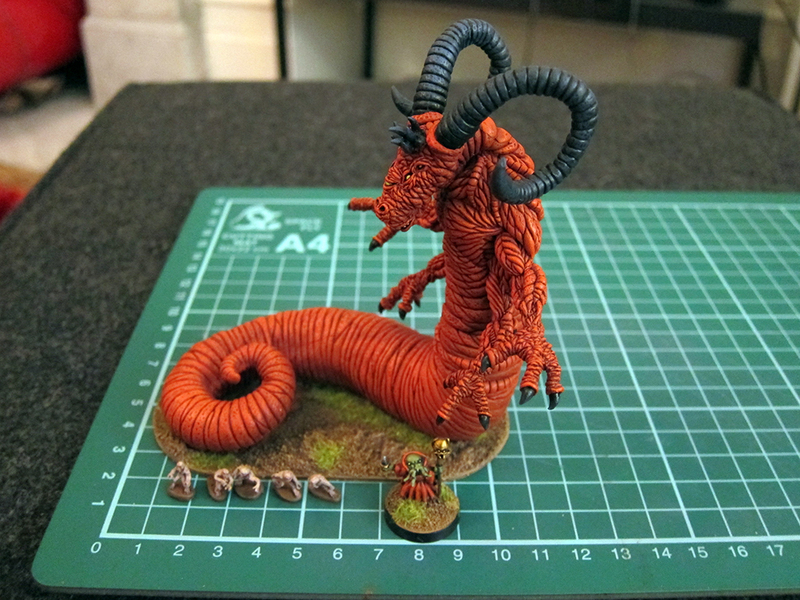 It's an extremely imposing tabletop presence in 15mm scale. 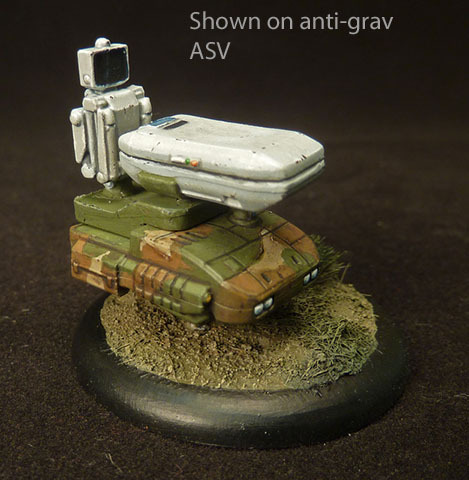 Alien anti-grav armoured fighting vehicle employing advanced technology -- armoured personnel carrier variant. 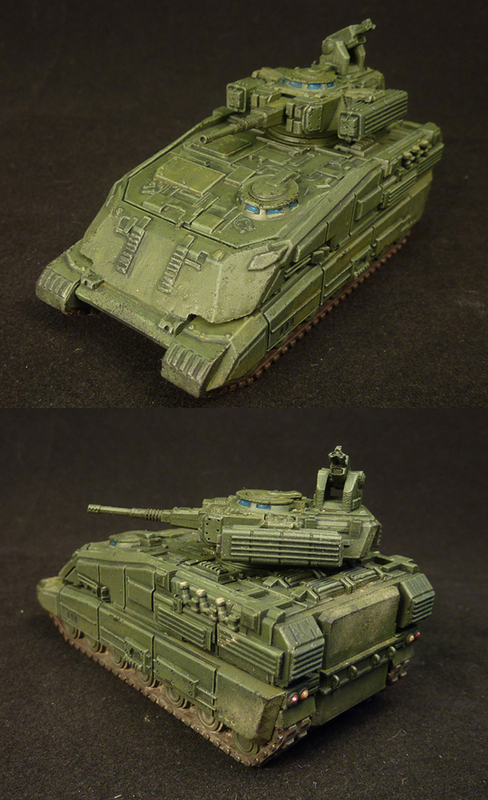 Alien anti-grav armoured fighting vehicle employing advanced technology -- Main Battle Tank variant. 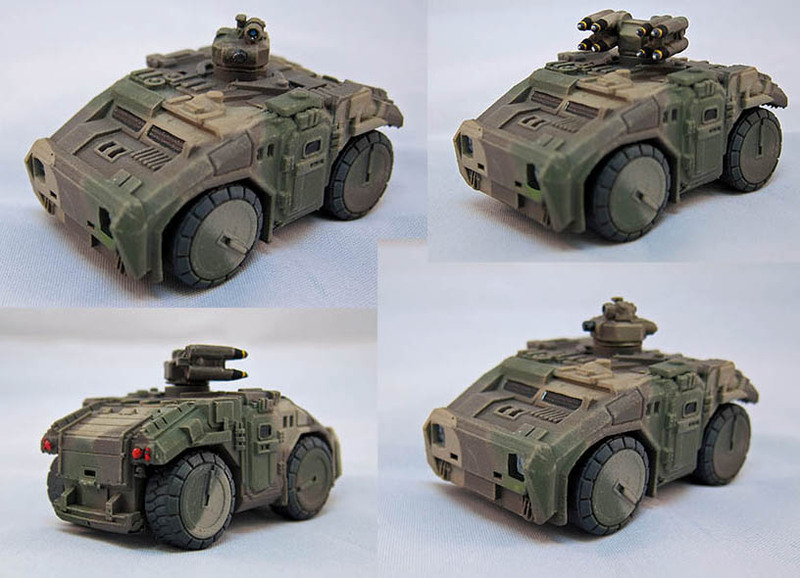 Alien anti-grav light armoured fighting vehicle employing advanced technology -- scout with communications array, missile turret, and laser cannon turret variants. 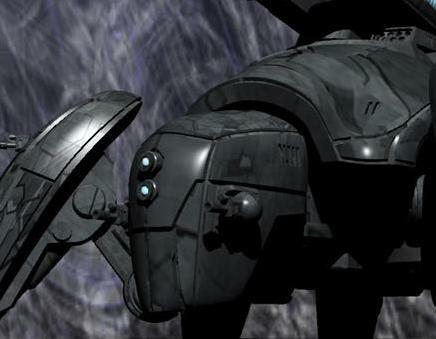 A small orbital insertion pod, large enough for perhaps 2-3 unarmoured men or 1-2 men in power armour. 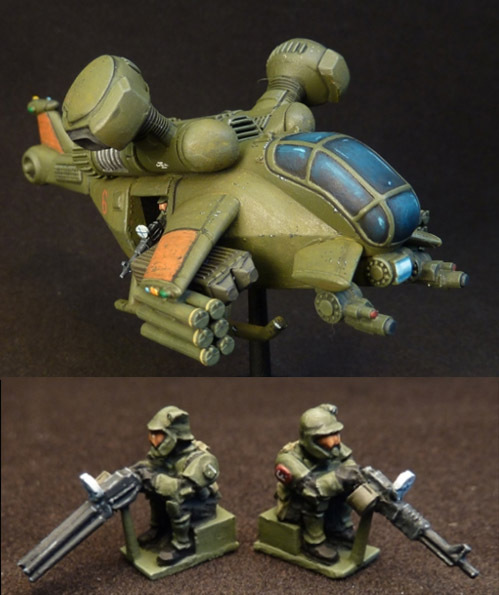 Includes a small grenade launcher on the "mast."